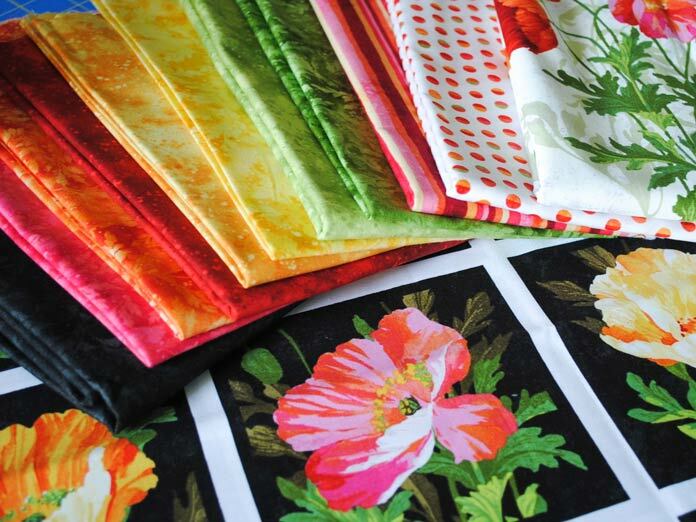 Yesterday on QUILTsocial I introduced you to Northcott’s new Full Bloom line of fabric. These fabrics are so bright and cheerful and I can’t wait to get sewing with them. Tomorrow I’m joining a bunch of my quilting friends at a sewing day at a nearby community center so I thought it’d be a great opportunity to show you how I get ready to go on retreat! So, maybe focus is a problem for you, but being organized can still make things go SO much faster! 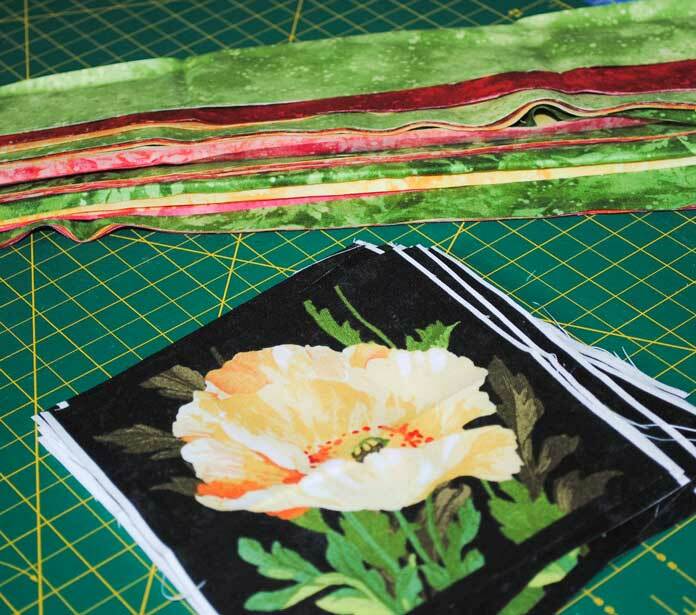 I always pre-cut the fabrics needed for at least 3 projects before I go on a retreat. And then, I bring along some other projects to work on if I get bored with the first three. I bring along a hand stitching or punchneedle project to do while I’m chatting with friends and the rest is all machine work. I LOVE organizing things in baskets, and going on retreat is no exception! Go to the dollar store and buy at least 4 or 5 of the flat baskets that are about 9″ x 11″. Put each project (and all the threads or special gadgets that you need to use for it) in its own basket. You can stack these baskets on top of each other and if you have a big enough tote bag, you can stack them right inside. 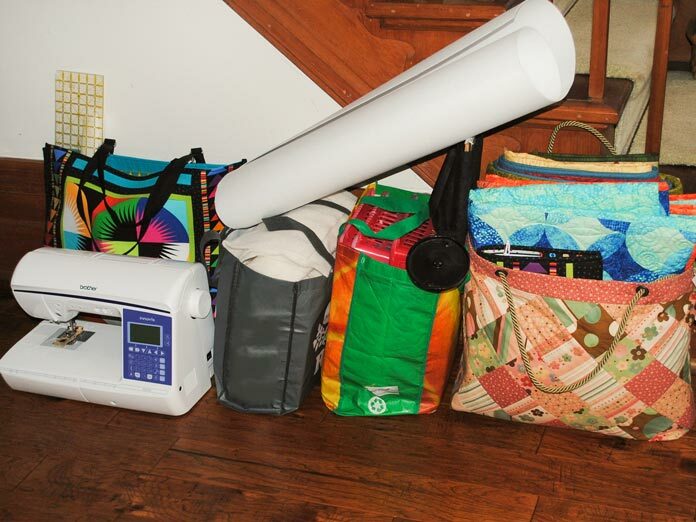 Make sure you bring EVERYTHING that you usually use when you’re quilting – your cutting board, rulers, rotary cutter etc. Sure, if you forget something, someone will probably loan it to you, BUT you don’t want to waste time (not yours nor your quilting buddy’s) borrowing something that you’ll need to use over and over again. 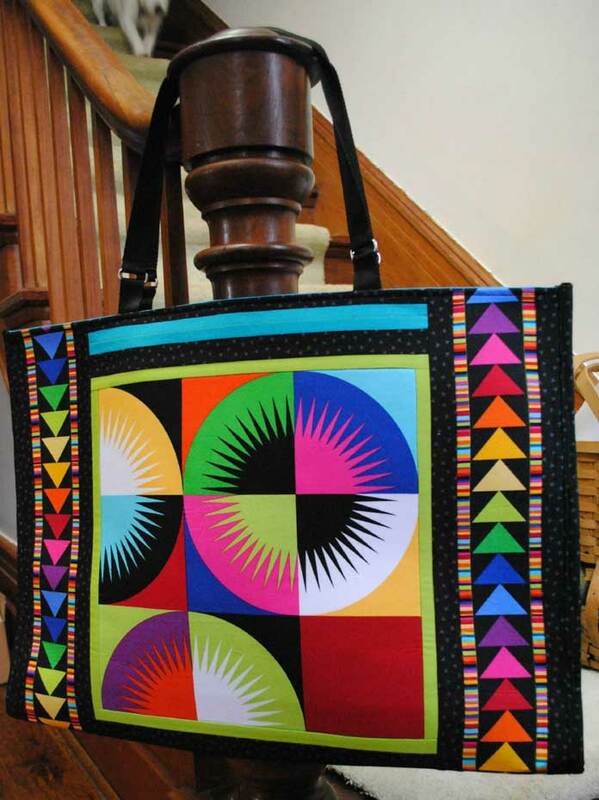 Check out my QULTsocial post from December 2015 where I showed how to make this AWESOME retreat tote. 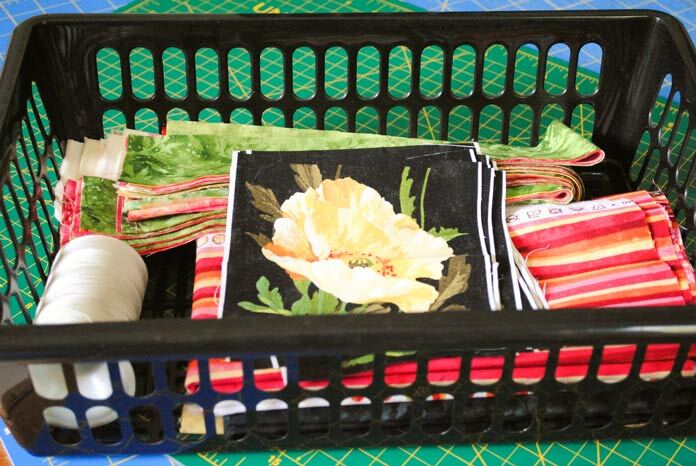 This tote holds all quilting necessities when travelling. 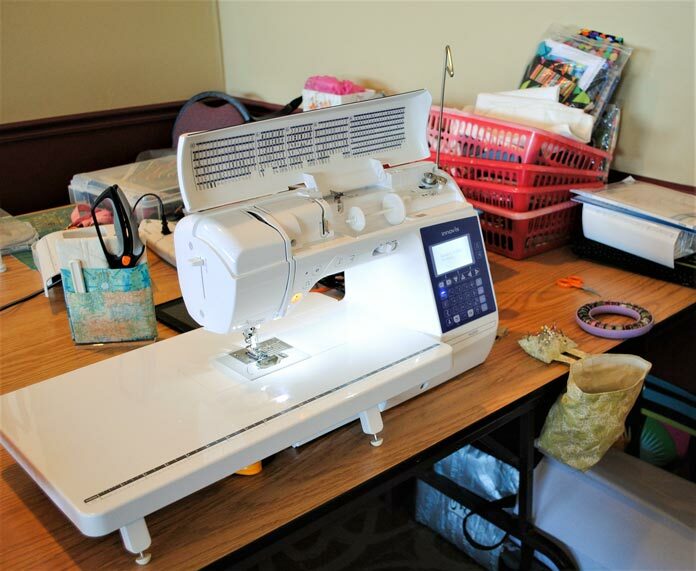 NOTHING is more frustrating when you get to retreat than having a sewing machine that won’t sew! So save yourself the frustration and get your machine serviced and cleaned a couple weeks before retreat. Don’t leave it to a few days beforehand in case some part needs to be ordered in or in case everyone else going on retreat left it to the last minute too! Along with this is Step 4B – find your machine manual and put it in your bag of tools! When I go on a retreat I start packing my quilting essentials a week in advance. Every time I think of something, I add it to the pile. My clothes, I usually don’t worry about until the night before, but fashion isn’t the focus of quilt retreat anyways! When you get to the retreat, claim your space and set up your stuff. As you can see at the last retreat I went to, I had at least four baskets with projects in them, all ready to go. All set up and ready to SEW! If you’ve never gone on a quilting retreat, you owe it to yourself to do some research to see if there is one running in your area. A good place to ask is at your local quilt guild or at your local quilt shop. They often run a couple a year. And then there’s also the quilting cruises that you could go on – there’s something to dream about!! Tomorrow, I’ll be working on making the blocks for the Full Bloom lap quilt and I’ll share some tips for overcoming your fear of ‘random’. You should try it sometime Jenny – they’re so much fun and SO productive! Great tips – can apply lots of these tips to other events as well. Thank you. Thanks Lynn – I’m glad that you found them helpful! Great tips. I haven’t been to a quilt retreat but hope to one day! If you get the chance I highly recommend it Linda. So much fun and very productive! Helpful article. Love those bright Full Bloom fabrics. Thanks Holly – I just loved working with those fabrics!